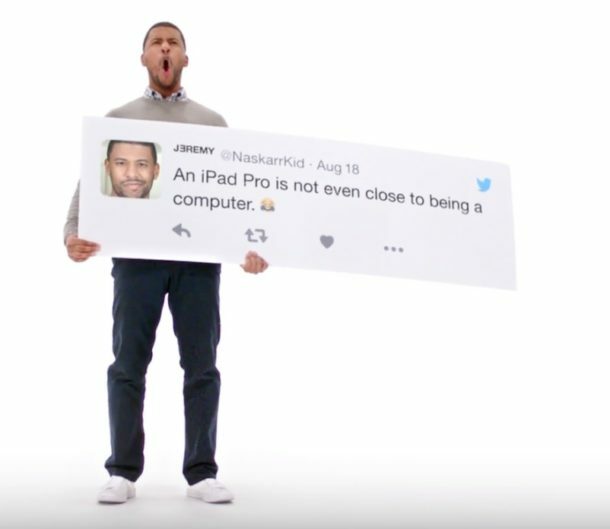 Apple has a new iPad Pro television advertising campaign that markets the iPad Pro as a computer replacement. In the commercials, the iPad Pro is pitched as being “better than a computer” or suggested that it’s more capable than a computer in various ways, including the ability to use Microsoft Word, use LTE to get on the internet, avoid PC viruses, and be faster than many laptops while having a touch screen to write on (though it should be highlighted that Apple Pencil is $100 and sold separately, and the Smart Keyboard shown is $149.00 and also sold separately). The ads are running concurrently with other Apple Commercials, including several spots promoting iPhone 7 and Apple Watch. What do you think, is the iPad Pro a computer replacement? Is the iPad Pro better than a computer? Let us know in the comments. OK fun commercials that seem like a decent sales pitch, but I’m not sure that reality can meet the expectation set by the commercials. I have a technically novice family member who bought an iPad Pro for $730 – iPad Pro 32GB with LTE, no Apple Pencil or Smart Keyboard included – after being sold successfully on the computer replacement sales pitch. Unfortunately they have been endlessly frustrated by the iPad limitations and have found it’s not a computer replacement for their needs at all, so their $730 iPad goes largely unused and they continue to rely on a cheap Windows laptop for fairly simple tasks like working with PDFs and Word files, managing various files, uploading and downloading files, and emailing files. Yes those tasks may be theoretically possible on an iPad Pro using a host of various third party apps and various cloud solutions to perform conversion tasks, mimic a file system, and handle other basic system functions that iOS lacks, but if a novice user can’t figure it out quickly and finds Windows more intuitive for those simple tasks, is the iPad Pro really a suitable computer replacement for those tasks? I also have a friend who bought an iPad Mini under the same computer replacement sales pitch, and anytime they have to edit a picture or make a greeting card, they come use our Mac instead. They do a lot of emailing, web, videos, and Facebook on the iPad Mini, but for making things they want to use our Mac. Well, maybe they should have gotten a Mac to begin with? Me personally, I have an iPad but i stopped using it once I bought an iPhone Plus because the Plus screen is big enough to replace whatever basic tasks I used the iPad for. I would probably not buy another one given it’s limited use, but I do buy Macs and iPhones and recommend of those both. I say from experience that iPad is great for very simple tasks like email, web, video, basic games, but for anything more you will want a real computer. If your computer use is web and email, iPad Pro will work for you. I prefer Mac, but PC is cheaper than an iPad and is more capable too. I agree, most happy iPad owners I know use it for their kids, for Facebook or the web. For simple uses the iPad is good and maybe even excels because it’s hard to break. Any device that does not provide access to a file system is not a computer, by definition. It’s not a Touring machine, hence not a computer. Not a “Touring” (sic) machine? Do you now what a Turing Machine is? The file system has nothing to do with it. An iPad simply has a different way of storing documents which might seem limited if you are used to the conventional filing system, but works really well for many people. iOS has a “different way of storing documents” all right but it’s illogical and user hostile, having documents kept independently inside each application is crazy and part of why it’s impossible to multitask or be productive on iPad. Then photos are stored in the Photos app, and so are videos weirdly, so don’t look in a specific app for your pictures or videos because there is an app dedicated to those called Photos, yes Photos has your videos. Then there’s a TV app for your other videos, and no it’s not TV, and no it’s not the videos you recorded, it’s movies you downloaded from iTunes, but they call it TV, and no it’s not related to Apple TV. Apple needs to just make a “Files” app for iOS, basically a mini-Finder, and no iCloud is not a file manager. And no telling people to use Dropbox or OneDrive or HoopyLoop to mimic a file system via the internet is not a solution either, that’s a third party app that also requires a separate cloud service and a new download and a new thing to tinker with, learn, pay for, and worry about. iOS needs a real file system where files are stored and accessed directly, iPad needs a windowing system with a window manager for true multitasking and concurrent file and app management, and iPad needs a cursor for external precision control for mouse or trackpad use. It could also use a Terminal and IDE. Until then it’s just not going to be a productivity machine. The people I know who are most satisfied with iPad use it for Facebook and the web. It’s perfect for them. I couldn’t agree more. Until IOS comes with a responsive file system and other things you mention, it can’t function as a computer replacement. My employer wanted to replace laptops with iPads when they first came out. I set him loose with one for a week (without his laptop). That ended his drive to buy iPads for all. This amazes me, what do you work with that allows you to use an iPad Pro to complete the job? Do you think you’re more productive with iPad Pro than a Mac? I work for a maritime transportation company and travel pretty frequently. I’d say I’m equally as productive with the iPad as I was with my MacBook Air. The iPad is not better than a computer unless your computer is Facebook. So I have to go back to windows for content creation. Apple has abandoned the photographers (did anyone else see that coming?) . I use a Mac and would recommend one. If you don’t take the current MacBook Emojibar Pro seriously (I don’t either) buy the last gen 2015 model refurbished and you will still get a Pro machine rather than the macGimmick Emoji Bar. It’s a better holdover until Apple decides to put adequate RAM and hardware into the Emojibar Pro. I would recommend iPad to my grandmother, but it was too basic for my Mom and she went back to a PC. One serious drawback is that various third parties consider the iPad a “mobile”, and that can be a huge hassle. One example is Pinterest. They’ve put a lot of effort into an app and thus stopped any effort to keep the web version working for an iPad. It barely works. Their app is pretty good but they’re tinkering with it and they introduce bugs. For one bug, they finally admitted it existed then said “Sorry, we lack resources to fix it and no one else has complained.” For another bug I’ll have wait for the next release. No option but to use desktop for some things. Instagram has an app but it was designed for an iPhone, meaning I have to hold it vertically. It’s awful. The iPad won’t be like a desktop until third parties like Pinterest and Instagram are prepared to treat like one. Third parties aren’t going to treat iPad like a desktop until Apple treats the iPad as a serious piece of hardware rather than a big iPhone. Circular problem here, see? Why develop for a big iPhone? They already made iPhone apps, no point making a different one for a handful of iPad users. iPad sales are declining too. I will take a Mac over an iPad any day, not even comparable. It’d be like comparing a matchbox car to a real car. Every time i see an iPod, i think, how can i create on this?, then put the thing down, (having a default touch which start button which is very unreliable gives me negative perspectives on the iPods) how can that replace my MBA and the all mighty Mountain Loin OS10.8.5? Microsoft Sufrace. All the good parts of both. None of the lock down. iOS no viruses? Lol. Jailbreak by loading a web page has been a thing. Apple is cheating on their customers and their wallets for years. Only true Apple believers can’t get that. I do a daily newsletter 365 days a year. I donʻt have a problem turning that out on my iPad Pro with the Logitech keyboard. I also use it for research. Not sure what the companies are complaining about. Only one actually pointed out what he was having a real problem with: pro level photo processing. Basic text editing is fine for an iPad, but beyond this – graphic content, 3D development, compiling, etc…. takes a real computer with a real file system, font access, etc etc etc. And unfortunately NONE of Apple’s offerings come even close to the value one can acquire with a cheap PC. I’ve been an Apple devotee for decades, this is coming to an end because of this iPad , iPhone, and stupid watch obsession. Where are the professional computers?? It’s rather amazing to me that no one has yet mentioned that the iPad doesn’t host any programming language, compiled or interactive. Unless I’ve missed something in the App Store, it cannot be a computer. I really don’t see how an iPad could replace a Mac for anything other than basic email, streaming videos, and social media bs. The iPads my family and I use are basically good media slabs thanks to battery life and AirPlay, but aside from that, they’re too underpowered and handicapped to function as a legitimate computer. At least for the majority of tasks that I use a computer for. The touch screen is a lot of the problem. I have one of these. It’s a neat toy. But it hasn’t replaced my MacBook. For one thing, I absolutely cannot type on a flat screen. The touchscreen is great for Plants vs Zombies; I started doing much better when I played it on this platform. Also, some of the apps are different on the MacBook and the iPad. GarageBand, for instance. And I’m not talking about minor tweaks here. As for the “Apple pen”, a generic stylus works just as good, and costs a lot less. (Palm rejection is the most compelling factor of an Apple pen.) Later, I found one in a classroom that someone had lost, so technically, I didn’t need to buy one. And it works for my stupidphone, as well. Apple should wake up from their dream and start making real computers again – they completely forgot how real computers, suitable for a serious work, look like. They seem to be living completely detached from reality. The worst thing is that they don’t care what people think or require. My biggest frustration with my iPad is the lack of a true file system. Storing documents with their applications as noted above is a pain. I use the iPad for reading books and news items, email, and FB. Even though I have lots of apps, I turn to my Mac or Windows PC for creation. LOL! I couldn’t see myself programming, animating, nor creating 3D models on an iPad. There’s more I could list but you get the point. Grandma thinks her 7 year old granddaughter is a computer genius because she can take low quality grainy iPad photos and post them to Facebook. Apple’s target market for these ads is grandma. Btw Grandma also thinks that telemarketers can see her when they call. Now if Apple started a telemarketing campaign they’d make a killing selling iPads to early onset dementia patients.